Create a simple test Azure function for debugging and viewing the initial flow of events from the Event Grid. Perform this step regardless of whether you perform the others. Create an Azure function to receive and process Azure Service Bus messages based on Event Grid events. Utilize the Logic Apps feature of Azure App Service. The example that you create assumes that the Service Bus topic has two subscriptions. The example also assumes that the Event Grid subscription was created to send events for only one Service Bus subscription. In the example, you send messages to the Service Bus topic and then verify that the event has been generated for this Service Bus subscription. The function or logic app receives the messages from the Service Bus subscription and then completes it. Before you begin, make sure that you have completed the steps in the next two sections. Create a Service Bus Premium namespace, and create a Service Bus topic that has two subscriptions. You can use any method to send a message to your Service Bus topic. The sample code at the end of this procedure assumes that you are using Visual Studio 2017. Clone the GitHub azure-service-bus repository. 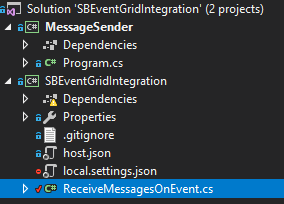 In Visual Studio, go to the \samples\DotNet\Microsoft.ServiceBus.Messaging\ServiceBusEventGridIntegration folder, and then open the SBEventGridIntegration.sln file. Go to the MessageSender project, and then select Program.cs. Before you work through the entire scenario, set up at least a small test function, which you can use to debug and observe what events are flowing. 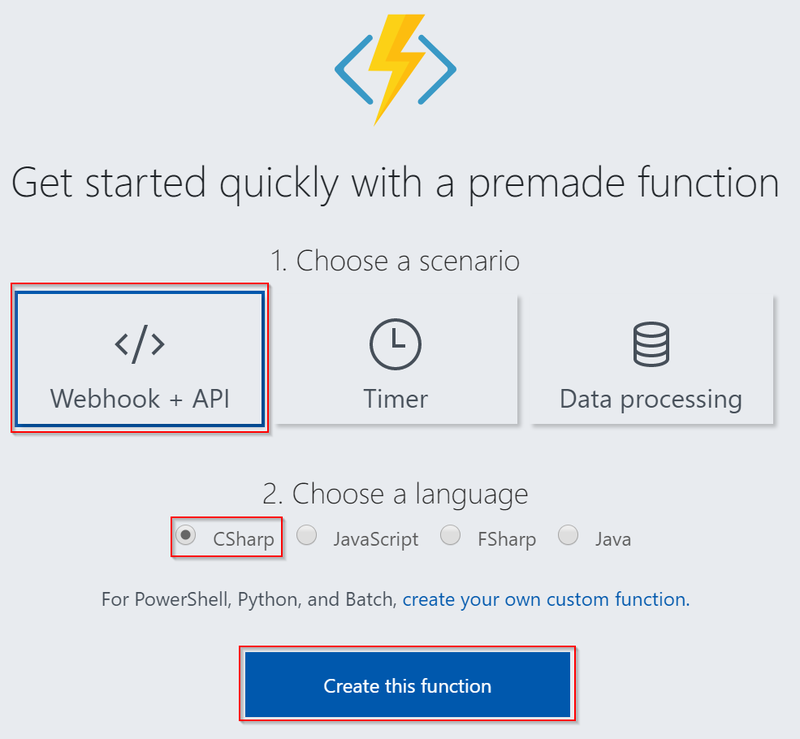 In the Azure portal, create a new Azure Functions application. To learn the basics of Azure Functions, see Azure Functions documentation. The Get started quickly with a premade function window opens. Select the Webhook + API button, select CSharp, and then select Create this function. In this section, you tie together the function and the Service Bus namespace. 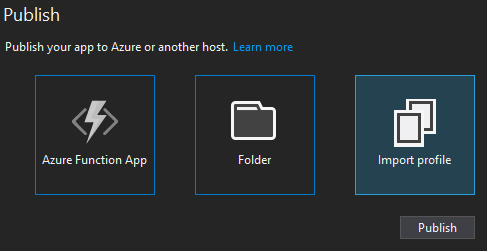 For this example, use the Azure portal. To understand how to use PowerShell or Azure CLI to do this procedure, see Azure Service Bus to Azure Event Grid integration overview. 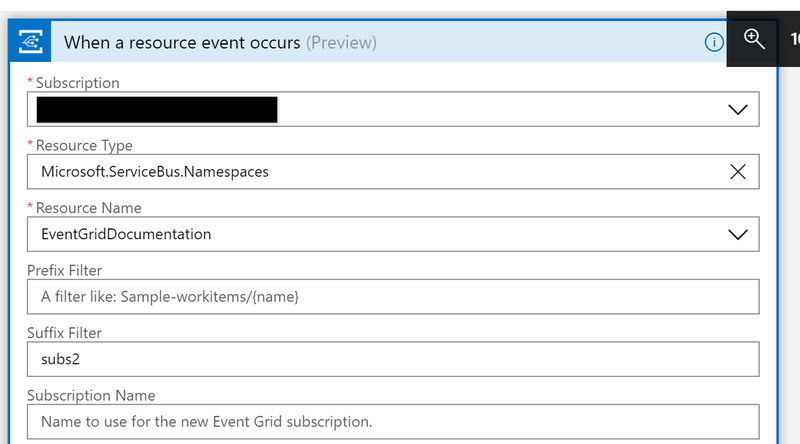 In the Azure portal, go to your namespace and then, in the left pane, select Event Grid. Your namespace window opens, with two Event Grid subscriptions displayed in the right pane. The Event Subscription window opens. 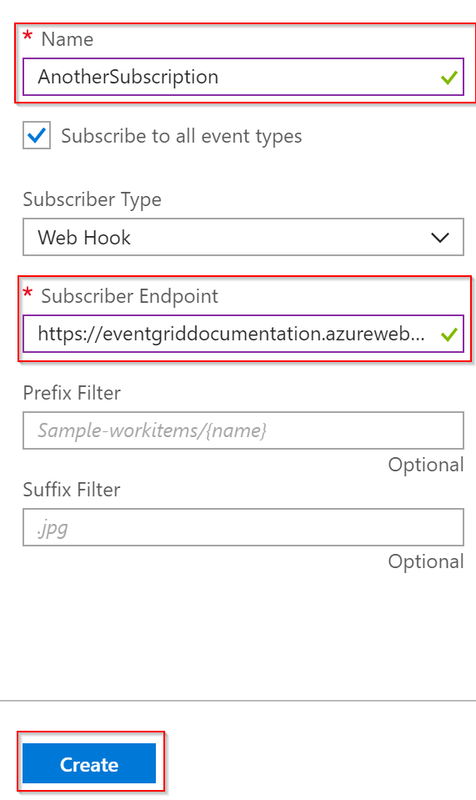 The following image displays a form for subscribing to an Azure function or a webhook without applying filters. Complete the form as shown and, in the Suffix Filter box, remember to enter the relevant filter. 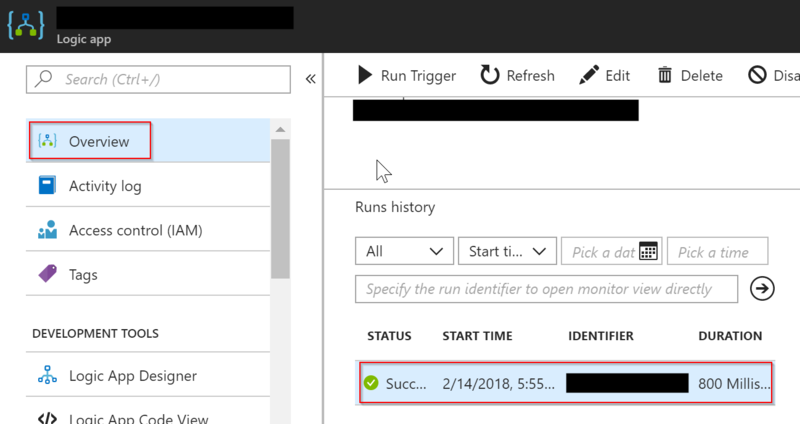 Send a message to your Service Bus topic, as mentioned in the "Prerequisites" section, and then verify that events are flowing via the Azure Functions Monitoring feature. The next step is to tie together the function and the Service Bus namespace. For this example, use the Azure portal. To understand how to use PowerShell or Azure CLI to perform this step, see Azure Service Bus to Azure Event Grid integration overview. In the preceding section, you observed a simple test and debugging scenario and ensured that events are flowing. In this section, you'll learn how to receive and process messages after you receive an event. You'll add an Azure function, as shown in the following example, because the Service Bus functions within Azure Functions do not yet natively support the new Event Grid integration. In the same Visual Studio Solution that you opened in the prerequisites, select ReceiveMessagesOnEvent.cs. In the Azure portal, download the publishing profile for the Azure function that you created in the "Set up a test function" section. In Visual Studio, right-click SBEventGridIntegration, and then select Publish. In the Publish pane for the publishing profile that you downloaded previously, select Import profile, and then select Publish. 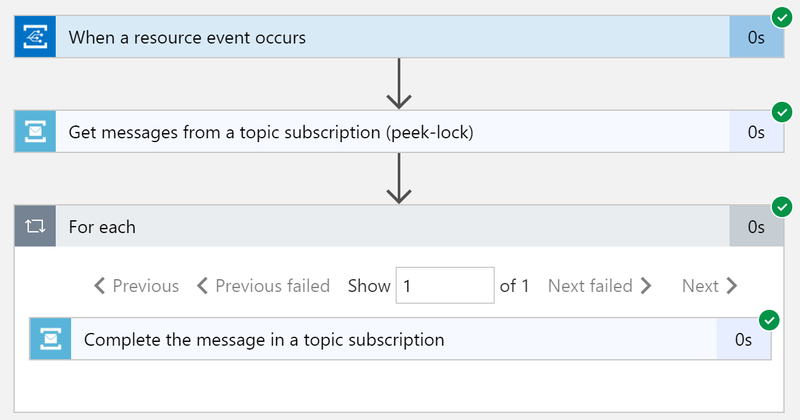 After you've published the new Azure function, create a new Azure Event Grid subscription that points to the new Azure function. In the Ends with box, be sure to apply the correct filter, which should be your Service Bus subscription name. 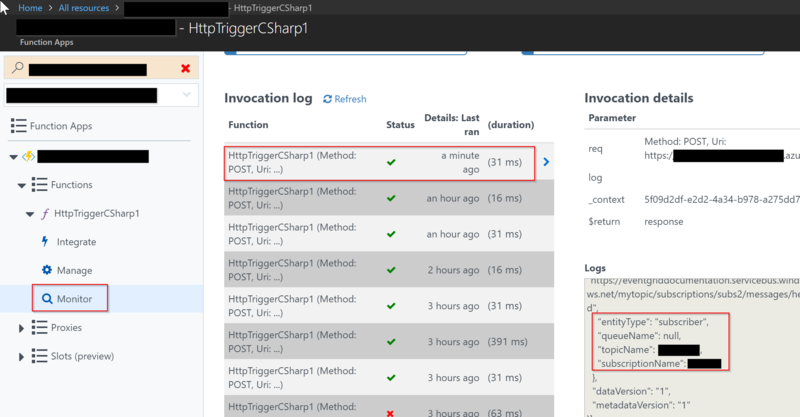 Send a message to the Azure Service Bus topic that you created previously, and then monitor the Azure Functions log in the Azure portal to ensure that events are flowing and that messages are being received. 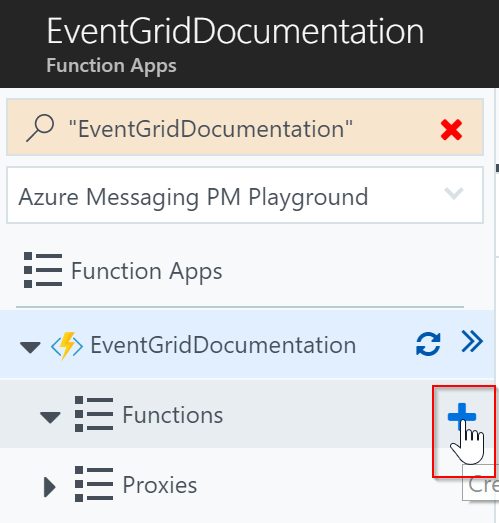 Create a new logic app in the Azure portal, and select Event Grid as the start action. The Logic Apps designer window opens. a. In the Resource Name box, enter your own namespace name. b. Under Advanced options, in the Suffix Filter box, enter filter for your subscription. 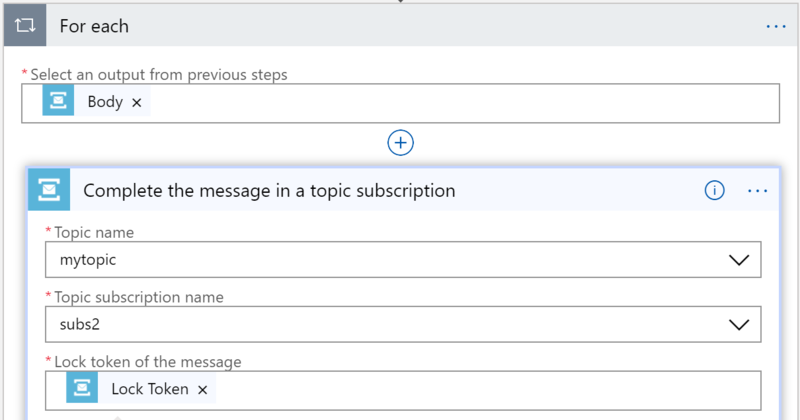 Add a Service Bus receive action to receive messages from a topic subscription. Save the logic app, and send a message to your Service Bus topic, as mentioned in the "Prerequisites" section. Observe the logic app execution. To view more data for the execution, select Overview, and then view the data under Runs history. 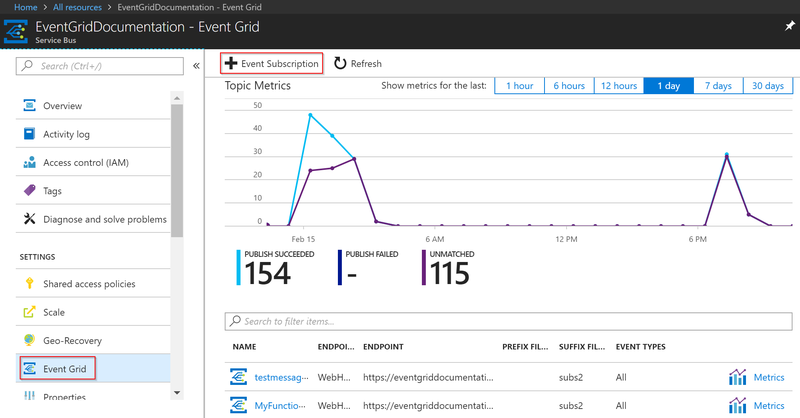 Learn more about Azure Event Grid. Learn more about the Logic Apps feature of Azure App Service.